We traveled to Seattle's Museum of Flight for the annual International Space Elevator Consortium to meet the engineers and space hippies that are working hard to realize the dream of one self-taught Russian scientist. Like all paradigm changing ideas, it at first seems impossible—instead of a harrowing launch to space aboard a powerful, flaming rocket, climb there slowly but surely on a long, self-supporting tether that extends a fourth of the way to the Moon. When you get up there, simply step off into orbit, or be flung outward into the solar system, at a cost of about 3,000 times less than NASA can do it with a space shuttle. The “space elevator” is the ride of the future, say enthusiasts, some of whom gathered recently in Seattle for the annual conference of the International Space Elevator Consortium (ISEC). They even have the construction material in mind, strong enough and light enough to theoretically support its own weight over its 100,000-kilometer length. But no one yet knows how to fashion this material into a long, sustainable ribbon. The science fiction writer Arthur C. Clarke, whose 1979 novel The Fountains of Paradise prominently featured a railroad-like space elevator extending upward from his adopted Sri Lanka, famously said that “the space elevator will be built 10 years after everyone stops laughing.” The scientists, engineers, and space hippies of ISEC have stopped laughing and have started designing. Carbon nanotubes remain the dream material of space elevator enthusiasts, the “unobtainium” that keeps them waiting and hoping. GETTING TO SPACE IS hard. NASA spends at least $10,000 for each pound sent into orbit, with launch reliability far below that of, say, airline standards. Of the more than 5,000 rocket launches since 1957, about eight percent have failed, including 1.5 percent of space shuttle launches. Space is still only for daring and hardy specialists. A space elevator would be a cheaper and safer, if slower alternative, without the “shake, rattle, and roll,” says Peter Swan, ISEC’s president. Swan has over 40 years of experience in the space systems business; other ISEC members come from NASA, national labs, or private industry. Most have a technical background in science, engineering, or information technology, and all are enamored of a vision where space elevators open up space like the Transcontinental Railroad opened the American West—where humans routinely travel to Earth orbit and beyond, build habitats and colonies in space, mine the Moon and asteroids for resources, and venture throughout the solar system. The space elevator was first conceived by the self-taught Russian scientist Konstantin Tsiolkovsky, who saw the Eiffel Tower in 1895 and wondered about putting a “celestial castle” atop a long tower that stretched to geosynchronous orbit, the altitude over 22,000 miles above the Earth’s surface where a satellite remains stationary above the same point on the surface. (Space nerds call this altitude “GEO.”) Modern work in 1960 by another Russian, Yuri Artsutanov, gave the idea a firm foundation in physics. American Jerome Pearson independently developed the same idea in 1975, which was the inspiration for Clarke’s 1979 novel. But Clarke’s imaginary tower had to be composed of a fictional material he called a "continuous pseudo-one-dimensional diamond crystal," because Pearson’s calculations (PDF) had shown that no material known at the time was strong enough and light enough to support the immense weight of even a thin tether. 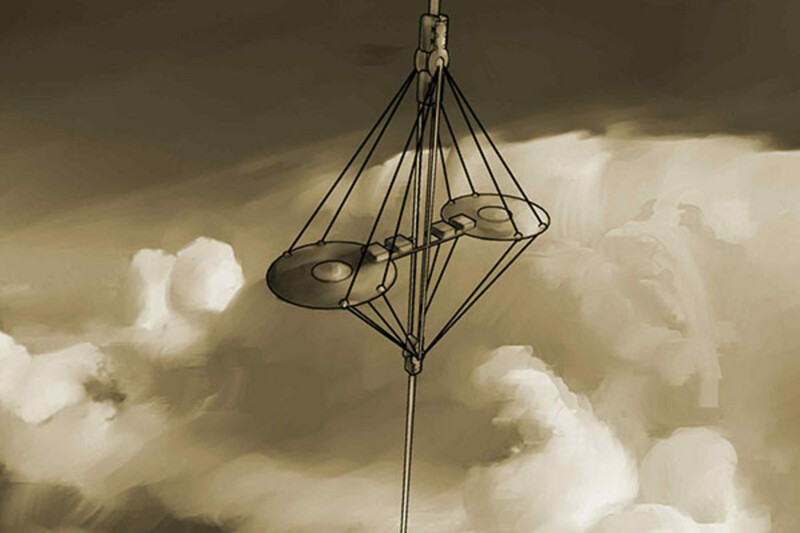 A space elevator hangs in the atmosphere, balanced about GEO, with one end anchored to the surface and the other holding a large counterweight. The ideal shape is a taper, widest at GEO and smallest at both ends. There the idea sat, said Pearson, who spoke at the recent ISEC conference held, fittingly, at Seattle’s Museum of Flight, recalling his relationship with the legendary Clarke. In 1979 Pearson realized (PDF) that a space elevator could be built on the Moon using existing materials like Kevlar or a boron/aluminum alloy, because of the Moon’s much smaller gravitational field. But an Earth-based elevator remained the dream. Then, in 1991, a unique material known as the “carbon nanotube” was discovered. It is a microscopic structure akin to chicken wire rolled into a tube, with carbon atoms occupying each point of intersection along the “wire.” Carbon nanotubes are a fantastic material—32 times stronger than steel, and six times less dense—easily suitable for the stringent requirements of an Earth-based elevator. CARBON NANOTUBES HAVE CREATED great excitement among materials scientists, who hope someday they will be fashioned into very lightweight but strong planes, helmets, and much else. But while nanotubes can easily be a thousand times longer than the diameter of their tube, their length is typically about a millionth of a meter. A pile of them looks like shiny, black soot. They can painstakingly be grown into longer filaments—the world record is thought to be about 55 centimeters—but weaving them into sturdy threads and ropes appropriate for the real world is still a goal and not yet an accomplishment. Until then, carbon nanotubes remain the dream material of space elevator enthusiasts, the “unobtainium” that keeps them waiting and hoping. “Handling carbon nanotubes is very difficult,” says Bryan Laubscher, an ISEC member and former physicist at Los Alamos National Labs. Laubscher has started a company in his garage, Odysseus Technologies LLC, trying to figure out how to grow and fashion carbon nanotubes into an elevator-like form. He has already filed for a patent on a “nanotube detangler,” and is working on new ways to grow carbon nanotubes that he’s keeping mum about for now. “For the space elevator, I want meter-long or kilometer-long carbon nanotubes,” Laubscher says. Meanwhile, Michael Laine of Washington state wants to build an elevator by 2020—on the Moon. He’s resurrected a company he was part of last decade, called Liftport, with $110,000 in Kickstarter funds raised last year. He’s working with several volunteers to think through the design of a lunar space elevator; it would, they think, be made of a material called Zylon, invented in the 1980s and used in tennis rackets, Martian rovers, and medical applications. Laine, who likens his role to “herding cats with Ph.D.s,” believes a lunar elevator could be built for as little as $800 million, largely by robots. It would give experience useful for a future Earthly elevator, and someday be used to bring back valuable resources like the scarce (at least on Earth) rare earth elements used in semiconductors, and helium-3, a form of helium used in medical MRIs and neutron detectors that is extremely limited on Earth (our supply is expect to run out around 2030). Liftport is in the process of signing cooperative research and development agreements with several key companies in the aerospace industry that they expect to announce soon. TO BE SURE, A space elevator on either the Moon or Earth remains a hugely formidable undertaking. The Moon is a harsh environment for humans, and an Earth-based tether requires much more than a material form that does not yet exist. In a design worked out in some detail by Bradley Edwards early last decade, with a grant from NASA’s Institute for Advanced Concepts, a space elevator would be anchored to a large ship somewhere near the equator in the Pacific Ocean west of Ecuador to minimize threats from hurricanes and lightning. Climbers fully loaded with about 44,000 pounds (on the Earth’s surface) would ascend the elevator powered by large Earth-based lasers shining on photovoltaic panels on the climbers’ bottoms. Traveling at about 150 miles an hour, they would still take seven days to ascend to GEO. THINKING AND WORKING ON the elevator idea for half his life, Jerome Pearson, now president of a small South Carolina company called STAR Inc. that develops aircraft and spacecraft technologies for government agencies, says its path has been different than he once imagined. “It looked like the main problem was the unobtainium,” he says, of the material required to build a real elevator, “and I thought nothing was going to happen until they got that.” But enthusiastic engineers jumped over that problem and designed climbers, held conferences, and wrote reports. Fueled by sci-fi visions of a human future in space, no elevator enthusiast would disagree. Until then, they are doing what they can, their eyes upward, looking at the stars, and most definitely not laughing. In preparation for colonizing space, a crack crew of middle-aged rats is colonizing a patch of Barcelona. The lure of colonizing space has moved from science fiction to the hard work of figuring out how to do it and what we get out of it.